I hope that you've got some fabulous Mardi Gras plans on your calendar tomorrow. We do! We won't make it to New Orleans to celebrate, but we are attending a lively Mardi Gras celebration at Luke San Antonio on the Riverwalk. Luke is part of Louisiana Chef John Besh's restaurant group -- so we'll get to enjoy a taste of NOLA right here in Texas! If you're celebrating at home, fire up some zydeco music, pop on some Mardi Gras beads...and make a simple, delicious dinner at home! 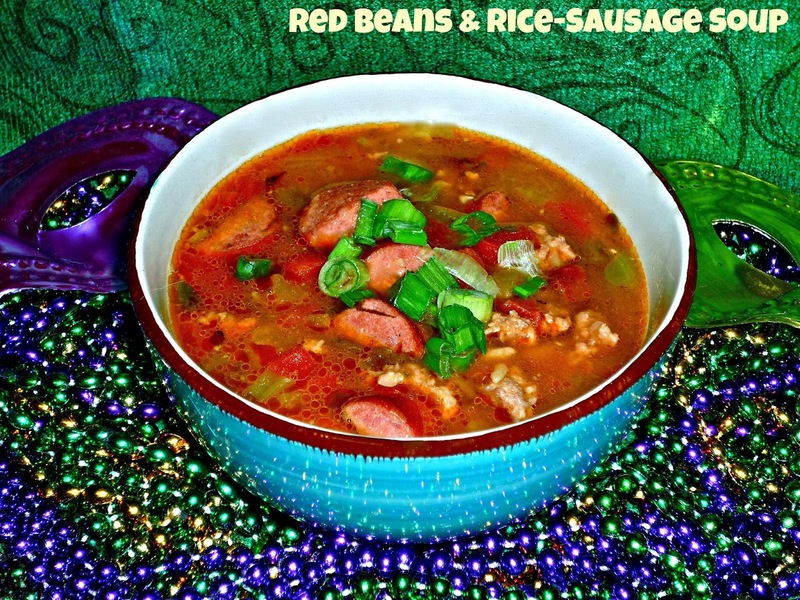 I made this Red Beans & Rice-Sausage Soup for our Mardi Gras dinner last year, and it's so good I wanted to share the recipe again this year. It's an economical and delicious meal-in-a-bowl. If you're like me and your weeknights are hectic, this easy-to-make soup will make a perfect Mardi Gras celebration dinner. 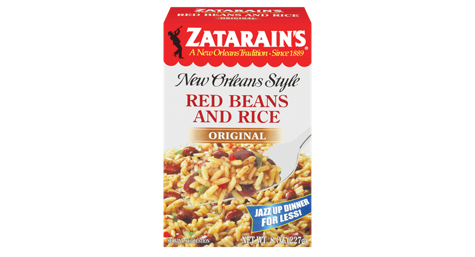 This hearty soup starts with a package of Zatarains' red beans and rice mix, and it's ready to eat in less than an hour. Most of that time is hands off while the soup simmers on the stove, so you have time to do other things. I love quick meals during the work week, so I was thrilled to find a recipe for Andouille Red Bean Soup on Zatarains' website. I tweaked their recipe a bit, using a combination of bulk pork sausage and smoked sausage. If you can get your hands on andouille, definitely use that instead of the smoked sausage. I also subbed low-sodium chicken stock for water and added a can of petite diced tomatoes for additional flavor and texture. This recipe made a large pot of soup -- we enjoyed four large bowls of soup and still had a large container left to freeze to enjoy on another busy weeknight! Step 1: Heat a Dutch oven over med-high heat. Add the olive oil and the two sausages. Cook until the sausage is browned. Add the onion, bell pepper, and celery. Cook until the veggies are softened and translucent, about 5 minutes. Step 2: Add the garlic and oregano to the pot. Give it a stir to combine and cook until fragrant. Add the petite diced tomatoes – juice and all – and hot sauce. Give everything a good stir to combine. Finally, add the red beans and rice mix and stock. Stir well to combine and bring to a boil. Step 3: Cover, reduce heat to med-low, and simmer the soup for 30 minutes. By then, the rice will be cooked and the beans will have softened. Just before serving, add the green onions and stir to combine. To serve, ladle the soup into bowls and top with more green onions and hot sauce, if desired. Everyone who tried this soup raved about it! It was thick and hearty, with a fantastic smoky flavor from the Zatarains mix and sausage. The consistency was perfect, and we thought the amount of spice was spot on. If you prefer your food less spicy, feel free to leave out the hot sauce. If you like it on the spicier end (like Michael does), simply add more hot sauce to your bowl to taste. I love to serve hot buttered cornbread with this soup, but crusty French bread would work nicely as well. Disclosure: Zatarains sent me a sampler of their products to facilitate this post. All opinions expressed are solely my own.